When plugged in power source, the Apple Logo appears, followed by a primitive Defective Battery Warning. The ORIGINAL BOX with Serial equal to iPod's body (the box is not in pristine condition. Plastic sleeve covering iPod. ). APPLE IPOD CLASSIC 1ST GENERATION - 5GB - WHITE. iPod has heavy scratches, nicks, dings. The headphone jacks are cracked but still works fine. We will do our best to make it right! Model M8541. Works with latest iTunes on Mac or PC. I'll throw in a FireWire PCI card for free if you're looking for a way to connect with a newer PC. Works perfectly, all original components. Battery still last 5 hours w/ constant play! Collectors Item. - RARE - iPod Touchweel 5GB Windows. Original Apple iPod Classic 1st Generation 5GB. In "Like New" Condition this Rare and beautiful piece of history Apple iPod Touchweel Windows 5GB First Generation, was just opened (removed the clear cellophane plastic cover) and them storage where it was just periodically in a reasonable way, connected to the power to ensure battery and components will be safe and fully functional. APPLE IPOD CLASSIC 1ST GENERATION - 10GB - WHITE. iPod has heavy scratches and nicks. Used, 100% tested, fully functional. We will do our best to make it right! NEW Apple iPod Classic 1st Generation (5 GB) in open box. You will surely get what you paid for! It can hold up to 450 songs, and is compatible with iTunes. It is VERY rare and you will be privileged to be able to buy it for this cheap of a price. Used Apple iPod 1st Generation. Comes with the green power cord attached. Works just fine it’s been reset and it’s ready to go! VERY RARE - Not many of these were manufactured in 2001. "M8541" and "10GB" on back; scroll wheel spins nicely. Works as new. Headphone jack perfect. It is also a wonderful conversation piece. And the music sounds better than the modern iPods. This is a White Apple iPod Classic 1st Generation 10gb. 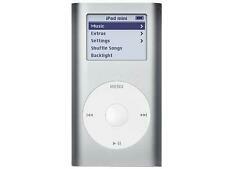 They did not make very many of these; most of the 1st gen iPods were 5gb. IMPORTANT: This iPod uses a firewire-400-->firewire-400 cable (not included). NEW IN ORIGINAL BOX - NEVER USED - ALL ACCESSORIES AND IPOD SEALED IN FACTORY PLASTIC. THIS IS TRULY A COLLECTORS ITEM AND REMAINS ONE OF THE MOST POWERFUL ICONS OF CHANGE AND THE NEW MILLENNIUM. Apple's iPod is the best music player a Mac owner can buy. The iPod's 5 GB hard drive holds 100 hours of high-quality music, and it connects to your Mac via superfast FireWire. We were able to transfer a single CD in about 10 seconds and a full hard drive in 10 to 15 minutes. Apple iPod Classic - 5th Gen (A1136). Upon testing, this iPod is FULLY functional. The iPod will have an engraving on the back. 30GB White. Fully Functional. There are no exceptions. RARE FIRST GENERATION IPOD! STILL FACTORY SEALED! BILLIE HOLIDAY PACKAGING! RARE FIRST GENERATION IPOD! STILL FACTORY SEALED! Condition is New. This item has never been opened. It was presented as a gift to the team that worked on the first iPod advertising campaign. This model has 10GB. Rare, collectable and excellently sounding music player. Official Apple iPod Classic 1st Gen White 5GB *VGWC*＋Warranty!! Warranty type :RFG Warranty. Warranty Included. First 2 sentences in the item specifics are also in item descrpition. Best one will be chosen when order received earlier than others. Warranty :Yes. 100% Genuine Product. Official Apple iPod Classic 1st Gen White 10GB *VGWC*＋Warranty!! It is the first and original iPod. Screen is in good shape with a few scratches and smudges. The scratches would not affect the use of the iPod at all. The iPod is in need of repair. It boots to the Folder icon. Ipod is UNTESTED. I have no idea if it turns on or not so it is being sold as parts/for repair. Please see pictures for condition of ipod. The 2nd iPod has a perfect headphone jack that can be switched out with the original. Fully Functional, Serial Numbers and Parts all original and matching (iPod, Backplate, and Box). Original EarPods Unopened, Authentic Apple FireWire Cable and Charging Block, Original inserts, Instructions, and Start-Up Disc. IT'S IN VERY NICE CONDITION.! LOT OF 2X APPLE IPOD CLASSIC 1ST GENERATION - 10GB - WHITE. iPod's previous history is unknown. We will do our best to make it right! Heavy scratches and may have cracked/chipped headphone jacks. IPod Turns on, then Folder appears, then shuts off. We only accept warranty with a RA #. All Canadian orders require a phone number. APPLE 1ST GENERATION 8GB IPOD W/ BLACK & SILVER COLOR. IPOD ONLY! Apple iPod 1st 5GB. Apple iPod Classic 1st Generation 5 GB Used. APPLE iPod 1st 5 GB RARE. Complete with: ORIGINAL BOX with Serial equal to iPod's body. golden opportunity for Apple collectors. VERY & GREAT COLLECTOR. APPLE IPOD CLASSIC 1ST GENERATION - 5GB - WHITE. There are information on the iPod from the previous owner. WHAT’S INCLUDED Sides/corners: Heavy scratches. APPLE IPOD CLASSIC 1ST GENERATION - 5GB - WHITE. —————————————. WHAT’S INCLUDED. Apple iPod Classic 1st Generation (5 GB) in good physical & working condition. Original accessories are also in good condition. Earphones Complete set of the 1st iPod released by Apple in 2001. Portable digital audio player with 5 GB of built-in storage. FireWire interface for fastest digital transfer available. Note: INCLUDES SYNC CABLE, EARPHONES. Ultrawide frequency response for high-fidelity sound. LOT OF 2X APPLE IPOD CLASSIC 1ST GENERATION - 5GB - WHITE. iPod's previous history is unknown. We will do our best to make it right! APPLE IPOD CLASSIC 1ST GENERATION - 5GB - WHITE - M8541. There are information on the iPod from the previous owner. Headphone jack is cracked but works fine. Sides/corners: Heavy scratches. Back panel: Heavy scratches. Trending at $109.99eBay determines this price through a machine learned model of the product's sale prices within the last 90 days. APPLE IPOD CLASSIC 1ST GENERATION - 5GB - WHITE. iPod has heavy scratches. We will do our best to make it right! Listening to music has always been a big part of people's lives and the rise in portable music players has only made that easier. Apple created a number of portable music players, one of which was the first generation iPod Touch, the first iPod to come with a touchscreen. With different controls, functions, and designs, there are factors that can help you decide if an iPod Touch is right for you. What Are Some Design Features of the iPod Touch? iPod Touch Screen: Whereas other generations of the iPod were controlled with buttons, the 1st Gen iPod Touch was designed with a 3.5-inch touchscreen. This means the music player was able to be controlled using tapping, swiping, and pinching motions on the screen itself. iPod Battery: In order to take your favorite music with you wherever you go, the iPod Touch has a battery life of either 22 hours of playing music or 5 hours of video playback. Headphone Jack: To listen to music or audio from your iPod, you must plug in headphones into the device. This is because the first-gen iPod does not feature in-built speakers of its own. What Are Important Technical Specifications of the iPod Touch? Storage Space: The big decision to make when choosing a first generation iPod Touch is the size of the device's storage. This generation of MP3 player comes with either 8 GB, 16 GB, or 32 GB of flash storage. Wi-Fi Connectivity: To download songs, videos and access the Internet, the 1st generation of the iPod Touch was compatible with 802.11 b/g Wi-Fi standards. No Cellular Data: The iPod Touch 1st generation is only able to connect to the Internet over a Wi-Fi network. This means it does not require a sim card to use, but also cannot access cellular data networks like a smartphone can. Applications: Much like an iPhone or other smartphone, iPods with a touchscreen also feature a whole range of applications, including a web browser, e-mail, maps, and more. Content is provided for informational purposes only. eBay is not affiliated with or endorsed by Apple.